SSR Speed & Spring Party! It might be hard to understand, but life is not only high speed racing, highly boosted engines, high torque transmissions and gear sets. At a certain point in time a little bit of beer, barbecue and rock'n roll is needed! And as usual the party is around our Pièce de résistance! The SSR Amazon ! Now as you know a little closer to speed. Above the SSR Amazon and Magnus dream of a wing tank at Boneville is resting. In front you see some training bombs which are non explosive. We always try to have some conversation pieces around us makes to make life more interesting. 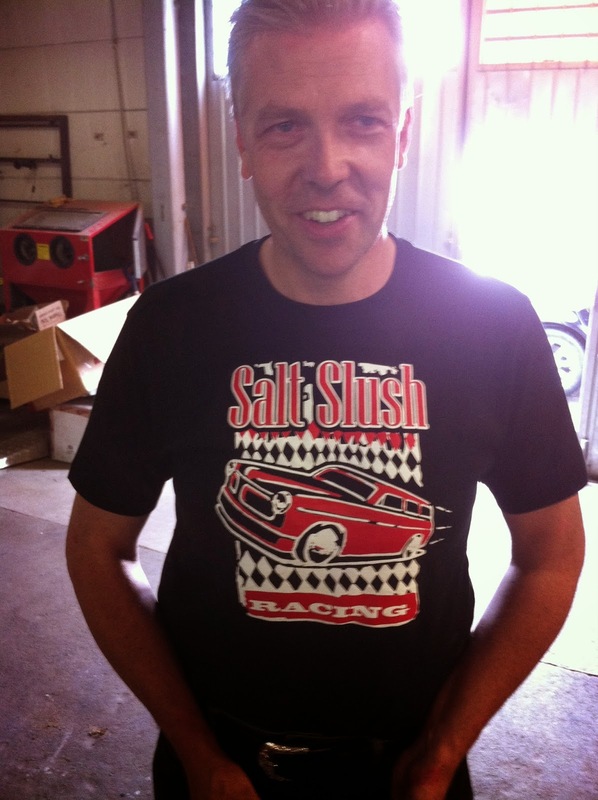 Nevertheless, Salt Slush Racing Team invited some gearhead friends to a Speed and Spring Party! But lets, statrt from the beginning. The SSR team arrived early to prepare for the party. Later on Magnus would convert his transmission in to salad. No worry its now fixed and repaired. Just for your info, later on in the evening the street was crowded with some very nice cars and bikes with both EU and US heritage and as well some serious JPN bikes. All with the common purpose: Speed! It was a warm day, yes just fantastic weather, we must have the force with us. But we were as always well prepared. …weather mingle soon to be Motor-Mingle. Getting to know each other kind of discussion. the 396' was talking to the crowd and it was big big big talk. At once everyone had something of high importance stuff to talk about. Even the gear head guests Ann and Helena enjoyed the burgers. We see it as a responsibility to offer an alternative to run your self tired and therefore Dennis after running is sent in to an intervention program managed by Jägarn. Kicki just after running Göteborgsvarvet... the situation was all rather serious, but we from SSR team urgently went in to our quick five step intervention program, and focused on giving her a beer as step one. The intervention discussion was rather quick 0,5 sec. The following four steps is four more beers. After that She was again, good to GO. What a difference 0,5 sec do ! We are even more encouraged in our engagement in the society. The Davidssons saved several years back. Martin & Johan We engage already in early ages to avoid issues later on. They are although both above 20. Johan has been in the Gasoline Alley program since minus age. The chop of the SSR Amazon gives a nice framing. Then finally..,The Royal Rockers! Live at SSR head quarter! Note there guardian well not angle but very much kicking and alive GW. The band members are the twins Magnus and Niklas Börjesson, Niklas Kvillert, Niklas Rosell, Johan Holst. We ca already now tell you that they are good, they for sure delivered the right and outmost Party feeling. A picture is more then 1000 words. so above it would have been more than 3000 at least if you add the music. Royal Rockers Band member & Salt Slush Racing Team Member. The all mighty Magnus Börjesson in person. Here in a certain angle and a certain light that hide his dark sides. Finally, Karl-Johan and Catrine is leaving SSR HQ and their 354 hemi is howling it's song trough the dark night…. Most of all we would like to give you all a Big Big THX fore helping us having such a good party !!! See you next time !!! Do I Look Speedy !!! Today the SSR Amazon talked to us for the first time and it wasn't Mama. The first word was SPEED ! Why did this happen? We have a theory. Santa was at the SSR WHQ Garage somewhat delayed compared to his normal end-of-December appearance. But who cares? Santa had, as we told before, some gifts delivered and when we concentrated and silent mocked up the stuff, we all of the sudden heard a voice from somewhere. Conventional parents would of course mention love and building of confidenece combined with strive and ambition....but besides that...we know for sure, that there is logical and natural explanation. Volvo N3T 6 cyl engine with two big big big turbos. And Currie, we didn't say anything when we saw the drive shafts....we just looked at each other quietly. But in our minds there was one word building up... Bullet proof! On top of the rear axle you see the ladder bar kit for the rear axle. Mr Tremec 6 speed gear box capable of 1000 Nm, high rpm and speed. One of the big turbos !! Capable of providing + 400 hp. Yeah your right! Two makes + 800 hp! We know that we, as parents, providers of mechanical skill and ambition will have to continue to raise our baby. It will need even more love, speed, torque and horsepowers. But trust us. It's in good hands. Dressed for Success ! New limited edition !!!! Our first edition limited to only 100 T-shirts sold out in almost H&M manner, only a very few left in stock, now for reduced to a price of almost nothing (125 sek). Now the 2nd edition, even better in quality and limited to only 100 is available for a price of only 150 SEK. It has a graphic design made by an infamous underground artist soon to be more famous than early Andy Warhol, his last name is Börjesson, remember that name. SSR is taking responsibility in the community and is supporting young artists according a not known 5 step model. Hurry up to place you order. Be part in culture making and the building of a foundation for the future. Those of you who join our Release, Spring and Speed Party can buy The Miracle at the event; the rest of you can just pass by the SSR WHQ when it's manned. Håkan happy as always but now his dressed for success. Good looking clothes can do a lot for a rather old but still renaissance Man ! Håkan and Carina in the 2nd, better than ever edition, Kalle in the rather good, until now best ever 1th edition, Anders suffering in some other T-shirt, Anders and Kalle will asap purchase the new edition. At latest by payday this month. As mentioned before, we've all had the experience. The waiting. The waiting for the good stuff. Which normally never happens. But for us it did happen. Santa all of a sudden showed up. Well equipped with stuff. The good stuff. First we measured the transmission dimensions with proper gauges, then we danced around it in circles while we tried to figure out how the hell to assemble it to the engine's rear face of block...what bellhousing and clutch to use...etc. We realized that those thoughts are meant for the hangover. Right now we just feel true happiness. But obviously we need to get it out of the coffin. The rear-end gear seems to be ready for torque. A lot of torque. I repeat a lot of torque...and power. Did I say anything about power? And torque? The biblical transmission dimensions gives us the confidence that we are on the road to....did I mention....no I did not. But I guess you know the place. 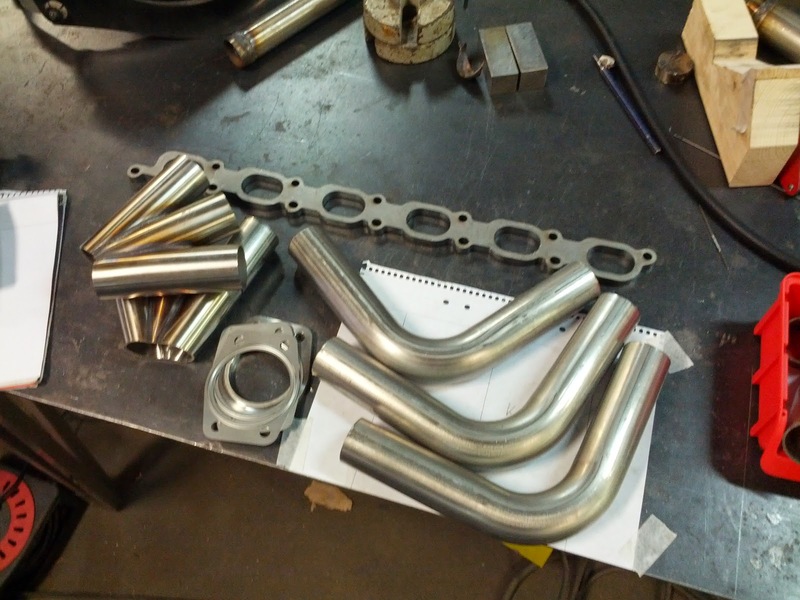 We now have all the parts needed to start working on the Turbo Exhaust Manifold. We have two turbos, each capable of ca 400 hp. 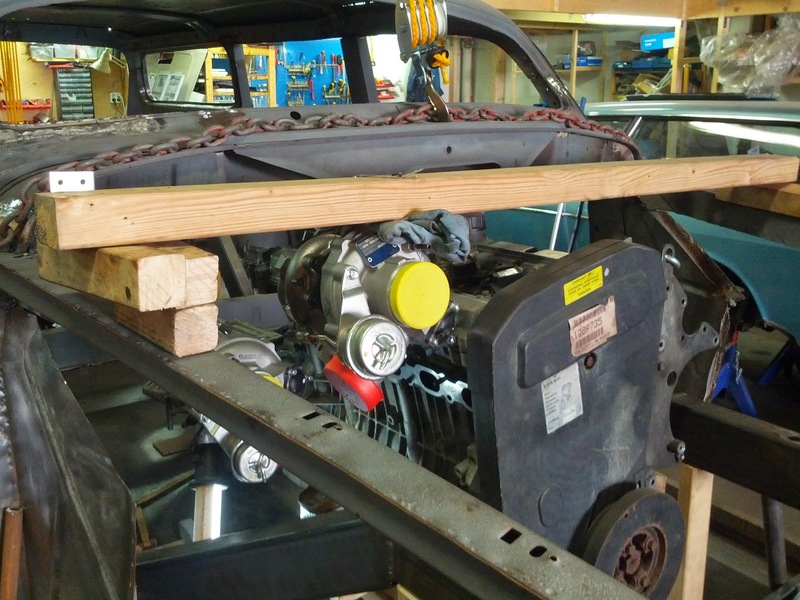 To install them we need to consider that 2 x 400 hp equates quite a bit of air and even more of exhaust fumes per second. And all of this air and exhaust will need to go through the turbos, either on the cold side or the hot side. This translates to pipes, pipes, pipes and plumbing, plumbing plumbing. In the picture we see the two chargers hanging in the precision jig at their very exactly calculated position. The red and yellow caps are on air side. The yellow is input air and the red is compressed air out. 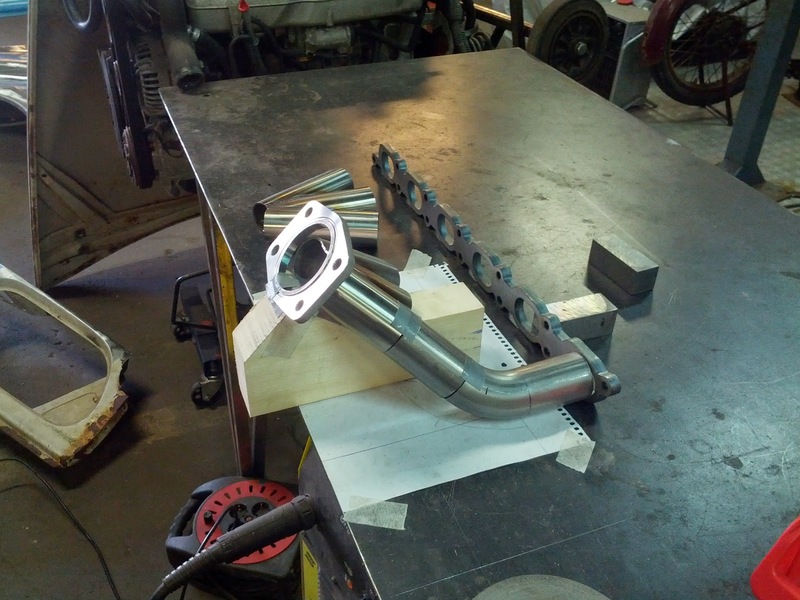 The hot side is behind, and will have hot, high energy, exhaust coming in from the engine and it will output less hot and less energized exhaust to the rest of the exhaust system. The energy in between will propel the compressor at the air side. Time to figure out how the pipes should bend. Lacking sophisticated CAD software we fabricated a sophisticated wooden jig. With additional intricate lines on a paper we concluded where to cut the bends to meet up with both flanges and the collector flute in between. Next is welding it together. With in house extensive experience of MIG welding - in all sort of materials ranging from pure rust to under body bitumen, and the occasional mild steel - I say, this must be easy. 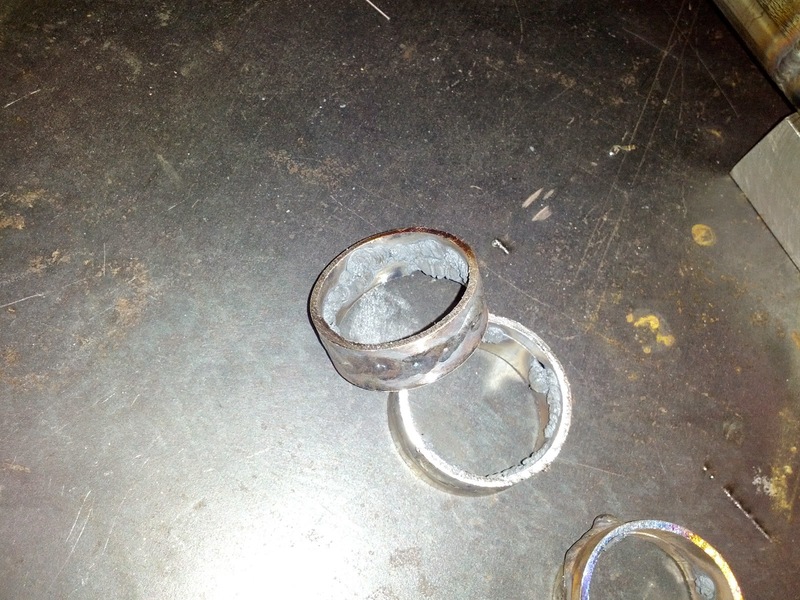 Add to this that stainless steel tubes deserve welding not with MIG but with TIG. 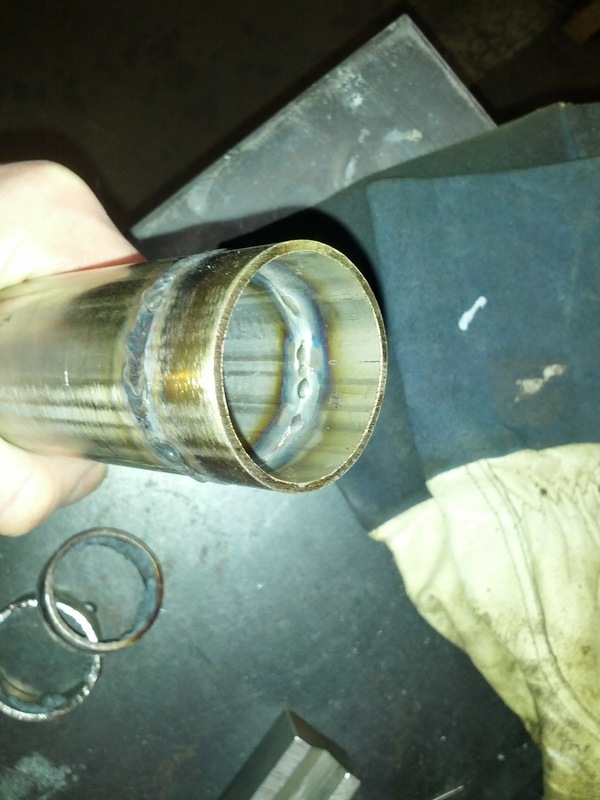 And TIG is the pinnacle of all welding techniques. Its supposed to give you so much control and feeling that failure is not possible. After some Youtubing and Googling I realize that TIG welding stainless requires "purge gas" or "root gas" on the inside. This is because stainless contains chrome and chrome will combine with carbon dioxide in the air and form an ugly crust. 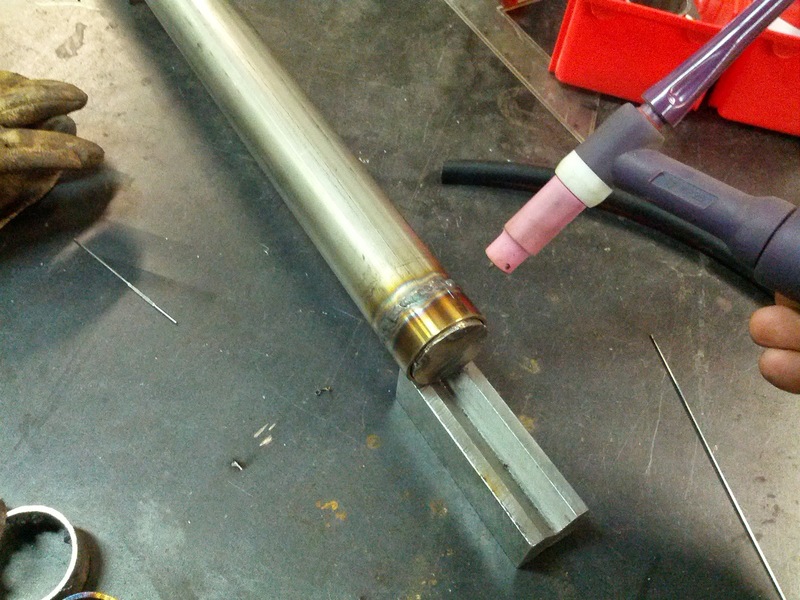 Next is to measure more and cut up all the pipe bends and actually start welding the real thing. More will come. But now at least published in a magazine ! 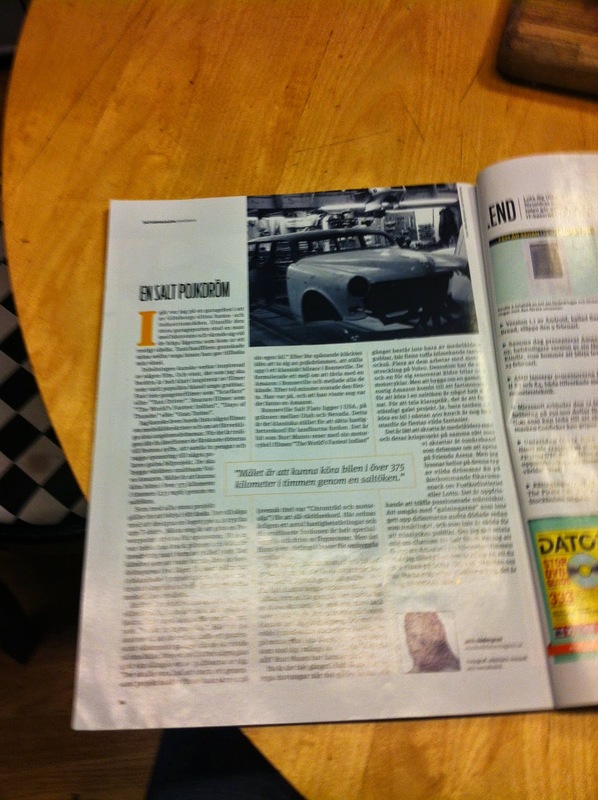 OK OK it's not Wallstreet Journal or Hot Rod Magazine, but still an article. 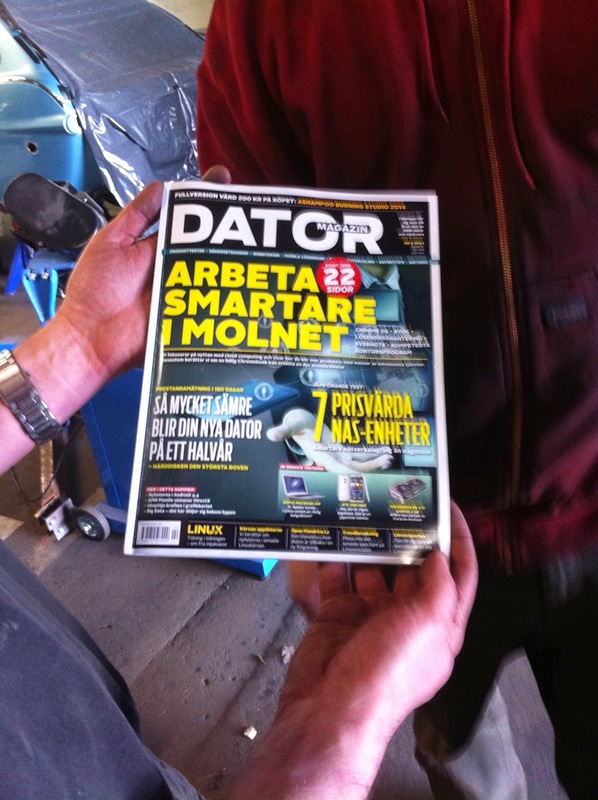 Länk to the one and only Dator magazine Datormagazin.se, the arena for Computers, and those connected. Magnus and Anders are touched by the moment. OK we admit, we want fame and fortune even if we understand that it's not around the closest corner. As said before, it's maybe not the biggest and most famous magazine on earth according to our references, but still important if you are into computers. At least in Sweden. Between the, how-to-work-smarter-in-the-cloud and your-aging-computer, there was a chronicle; a full page story about the SSR project and the team! Even more touched! Notice Magnus skill to read upside down one of his many skills. Picture of the Chronicle with the face of the one and only SSR Amazon. They start by referring to some type of boys dream ?? Which we don't understand this is serious, and a reality. som varit populära bland unga grabbar. kände. Efter två minuter svarade den första. allt? Burt Munro har funnits på riktigt. för att köra i en saltöken är något helt annat. utanför de flestas vilda fantasier. Long time member of the Garage and from the side following our build and journey to Bonneville is Tapio. He has an asset he allows us to borrow when times now and then gets more uphill. The röjsåg powered Margarita mixer ! 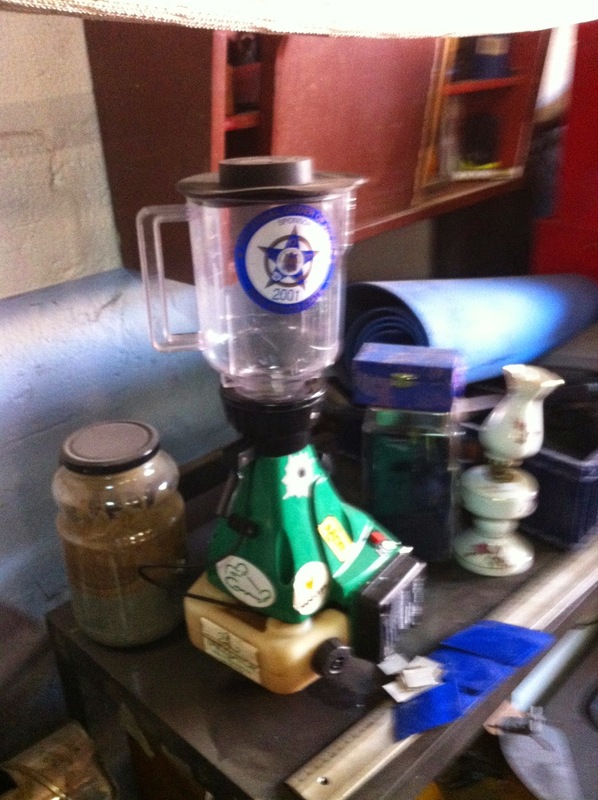 In our business plan there is a step in the future when we shall move up to a blender of our own with higher performance and capacity. There are examples up to Top Fuel V8's even take a look at the net.